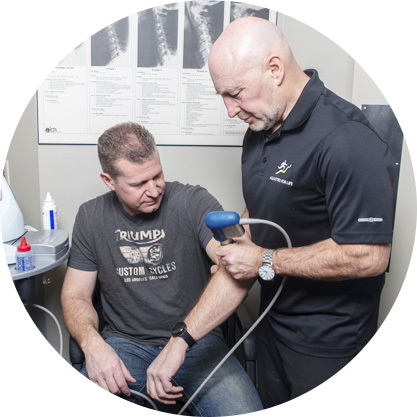 Calgary Chiropractor Dr. Les Davidson has been providing leading chiropractic care to his community and surrounding areas for nearly four decades. Dedicated to natural, compassionate care since 1982, he is an expert in his field and is ready to help you live your best life. By restoring your movement, Adjusted For Life Chiropractic Health Centre will add life to your years. We are committed to confronting your pain and discomfort through collaborative care. Along with chiropractic care, we also offer massage therapy, decompression therapy, shockwave therapy and K-Laser therapy. While these therapies can be used separately to achieve quality results, they are most often effective when used in conjunction with one another. Our practice is also home to Firstbeat Lifestyle Assessments, a three-day study of heartrate variability, and body composition analysis. Acute conditions and nagging, chronic conditions alike can benefit from the help of one or all of our services. No matter your needs – our practice is equipped to address it all! More than anything, your health is our central focus. For this reason, our practice strives to understand the individual health needs of each patient in order to provide excellent care. As we hope to help you learn what we are doing and why it is being done, we also spend a great deal of time getting to know our patients, diagnosing them, and educating them about the services we offer as well as the benefits they promote. We are glad to answer any questions you may have throughout your time with us. Where your health is concerned, your body knows best. Adjusted For Life Chiropractic Health Centre is here to listen to it and get you better! Everybody is worthy of quality healthcare that allows them to live life to the fullest. Dr. Davidson and his team look forward to meeting you and helping you in any way possible. Whether you are aware of the nature of your problem or are just beginning to feel pain and discomfort – we welcome you. Schedule your appointment with our Calgary chiropractor today! Improved my alignment, flexibility and mobility. health plan also covered most of the cost. As an extremely active individual I was able to return to the same level of activity afterward. Thanks to Dr. D and his team for all your help! Thank you so much! I appreciate you guys fitting me in and doing such a thorough job! I’m so excited to move forward with my treatment plan and most of all to feel better! Thank you again! Pain has subsided quicker than past injuries. Yes! No longer in constant pain like I was when I first came in. Sleep, standing, bending, sitting and twisting are all improved after Dr Davidson’s care. It has improved my mobility, decreased the pain allowing me to sleep better at night. I was grateful for the friendly and competent staff. I never felt double booked as service was prompt. The waiting area always appeared clean and inviting. I would not hesitate to recommend Dr. Davidson for chiropractic work especially in regards to ‘shock wave’ treatments.